The Annual Key Club Haunted House is open at North High from 6pm-8pm tonight! Bring a bag to collect candy & wear your costume! This is for elementary aged students and is FREE. All proceeds benefit Discovery Station and UNICEF. October 22nd through October 26th is a week that focuses on Character Education. We will be celebrating with a school wide spirit week and daily discussion around the 6 character counts pillars! Monday, 10/22 - Wear Fountaindale apparel or Red, White, & Blue! We all show CITIZENSHIP in our Fountaindale community! Tuesday, 10/23 - Wear Black or White! There are no gray areas when it comes to TRUSTWORTHINESS and RESPONSIBILITY! Wednesday, 10/24 - Wear your favorite team jersey, sweatshirt, etc.! We should always play FAIR! Thursday, 10/25 - Twin Day & write a note to your friend to let them know you care! We CARE about our friends! Friday, 10/26 - Wear camo and/or yellow! Your RESPECT does not go unnoticed! Do you ever wonder why you're never asked to help your child(ren) sell wrapping paper, cinnamon rolls, pizzas, or chocolates? Because the Fountaindale PTA understands that all of that can really be a hassle, not too mention, everyone else is already doing it! So we have the “Non-Event” Fundraiser! There’s nothing to sell, nothing to pick up, nothing to put on a shelf for an indefinite amount of time, nothing to market to your co-workers, neighbors, family, or anyone else! And unlike other fundraisers, 100% of your donation goes to your Fountaindale PTA! This totally hassle-free “Non-Event” Fundraiser will help to continue to support our students and staff at Fountaindale and continue to finance wonderful events such as: the Fall Fest, the Cultural Fair, Family Holiday Craft Night, Teacher Appreciation Week, & the Annual Ice Cream Social, just to name a few! Your donation will also help toward Fountaindale Yearbooks, Field Trip Assistance, Student Program Support, and other memorable activities for the students and families of Fountaindale! There is no set amount with the “Non-Event” Fundraiser either! We kindly ask that you contribute whatever you feel you can at this time. No amount is too small! BONUS: Everyone who donates will have their name entered into a prize drawing! Be looking for information to come home on Monday. Please complete the backside of the form and return it, along with your donation, to school: Attn: PTA “Non-Event” Fundraiser. If requested, you will receive a tax receipt letting you know that we have received your donation. You may also download a copy of the form on our "Non-Event" Fundraiser page! This year’s “Non-Event” Fundraiser runs from October 22nd through November 2nd. Fountaindale families have donated generously in the past! Our goal for this school year is $1,000! Please help us make it happen! Tour the World at the Annual Fountaindale PTA Cultural Fair! What is the Cultural Fair? The Cultural Fair is an evening designed to learn from each other about the various areas of the world our Fountaindale community comes from. Families create displays about their home country and guests visit these displays as they walk around. You may also choose to present a country that has special meaning to your family. Every family & staff member at Fountaindale is invited to participate! What should be in my display? Can I still come if I don’t make a display? Yes, of course! Come walk around & tour the world! You can read about and see pictures from various places, try different foods, and maybe even learn something new! This year, we would REALLY love to have students & families perform dances, sing songs, play instruments, etc. from their countries! Please consider participating & sharing your culture! If you would like to participate in the Cultural Fair, please sign up via our convenient Sign Up Genius Page by October 31st, so we may plan accordingly. You may also fill out and return the bottom of the form that was recently sent home with students. Fountaindale staff members were asked to fill out a Staff Spotlight questionnaire. This week is Mr. Jeff Byard! What do you do at Fountaindale? How many years have you been at Fountaindale? Do you have any children and/or pets? Tele-transportation - There are so many places in the universe that I would love to visit. The PTA is currently on a mission to bring back the STARS award program! Thank you to our first confirmed supporter, Sheetz! And we would like to proudly announce and thank our second confirmed sponsor, Central Dawgma! Thank you both for believing in our mission to recognize and celebrate STAR students! If you or your business would like to sponsor part of the STARS Awards Program, please contact Carmella Myers. The Annual Fountaindale 5K Run/Walk is coming up on Saturday, November 17th at North High! The 5K begins at 9:30am! Green registration forms were sent home with students this week. Students do not have to be in the Fall Running Club to participate. All elementary students are welcome! The Fountaindale 5K is FREE for children through grade 5 but must be accompanied by a registered running buddy (age 13+). To register, please complete the green form that was sent home. Return it to the front office at Fountaindale along with cash or check made out to the Fountaindale PTA. Registration is $20 before 10/31 and $25 after 10/31. Race Day Registration will be open from 9am-9:30am and will be cash only. T-shirt orders are separate from registration. T-shirt order forms are located on the backside of the registration form. The 2018-2019 Fountaindale 5K T-shirts are long sleeve and made of moisture wicking fabric. T-shirts are $25 for FREE for Fountaindale Running Club Members who register for the run with a paying Running Buddy! You must be registered & T-shirt ordered by 10/31 to guarantee availability. Please return the form with cash or check made out to the Fountaindale PTA. The 5K uses the North High Cross Country Course and proceeds benefit the Fountaindale Running Club and other After School Academies. If you're not a Fountaindale Shoparoo-er yet, what are you waiting for?! It's so simple & absolutely FREE! Snap pictures of your receipts! ​See? Easy peasy! Spread the word because the more Shoparoo-ers we have, the more money we can earn! Tell parents, grandparents, aunts, uncles, neighbors, etc. because they don't have to live here to help, they can live across the country or even across the world! 10/22 - "Non-Event" Fundraiser Kick Off! (1) Register online with Martin's today! (2) Then just shop as usual at Martin's! You can select up to 2 schools! Shop at Martin's and earn money for Fountaindale with every purchase from 9/7/18-3/16/19. 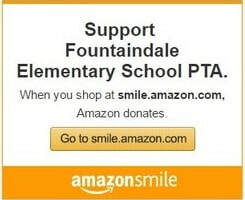 Did you know that the Fountaindale PTA participates in Amazon Smile? As of August 2018, we raised $80.53! Shop Amazon as usual but before you check out, go to smile.amazon.com and be sure that Fountaindale PTA is selected as your choice of organization! Then just check out as always! With every qualifying purchase, Fountaindale PTA will receive 0.5%.